As more details from Solange Knowles and Alan Ferguson’s wedding roll in, we can’t help but swoon. She broke quite a few wedding rules, but did so fabulously and gracefully like only a Knowles sister can. From her stunning pre-wedding party dress to her not one, not two, but THREE gorgeous wedding day looks, the girl sure knows how a thing or two about fashion! Last night Vogue shared the scoop on all their wedding day details, and we’re feeling pretty inspired. 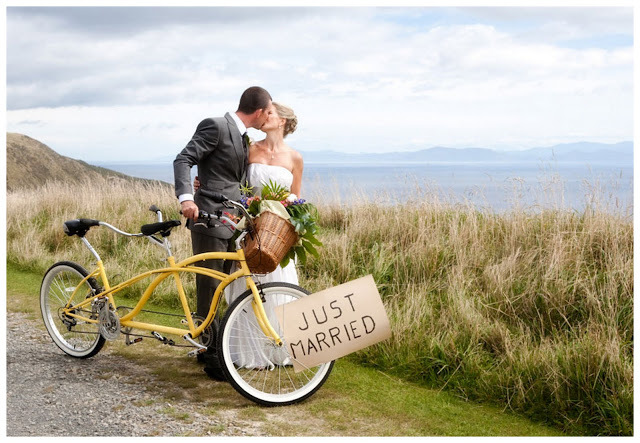 Here are six great ideas to steal for your own nuptials. 1. Arrive in style! Solange and her beau rode up to the Holy Trinity Church (their ceremony venue) on white bicycles. While manual labor might not be for you, you can still ditch the traditional stretch limo and get creative with your big entrance. Choose a mode of transportation that suits your personality, whether it’s a horse-drawn carriage, an old-fashioned car, or maybe even a boat. 2. Rock a pantsuit. We’re all about changing into a second dress for the reception, but what about a PRE-ceremony look? Solange showed up to the Marigny Opera House (the ceremony site) in a low-cut, ivory-toned jumpsuit and cape. To steal this look, look for a chic pantsuit or little white dress that goes with your overall wedding day vibe. 3. Plan for a costume change…or two! After her ride around town with her husband-to-be, Solange changed into a gorgeous floor-length gown for the ceremony. This second look also incorporated an attached cape, which gave her a dramatic, goddess-like aura. Oh, but Solange didn’t stop there. Later in the night, she slipped into a THIRD amazing outfit. She wore the flirty jumpsuit as she and her wedding party danced their way down the streets of NOLA by the light of sparklers. The costume change, while costly, is a fun way to transition into each portion of the evening. Plus, different looks make for lots of great pictures! 4. Make your photos into works of art. Solange commissioned photographer Rog Walker to take her official wedding portraits and the result was nothing short of breathtaking. The images were taken in the style of Vanessa Beecroft, a contemporary Italian artist. To imitate her photos, find a majestic room with a neutral palette and subtle, earth-toned details. This will create a dramatic yet understated backdrop for all your shots. Try to keep a straight face like Beyoncé and Tina Knowles did for magazine-ready photos! 5. Have EVERYONE wear white. 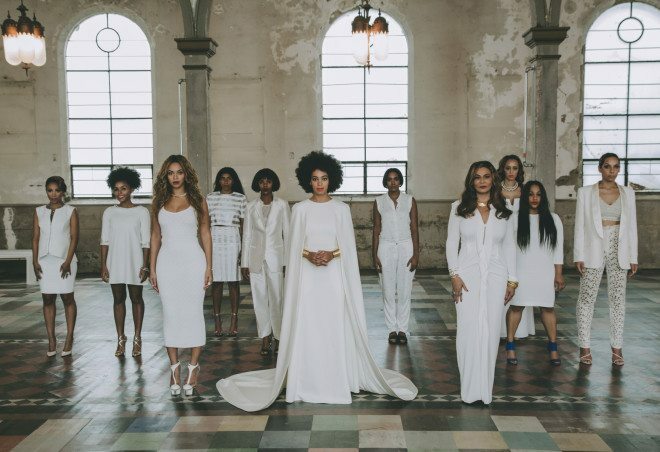 Solange and her new husband apparently went with an all-white theme for their nuptials. Based on the pictures that are surfacing from the weekend, those closest to the bride and groom donned white for the big day, including the bridesmaids and the groom! If your go for the all-white look for your girls, try to play around with shapes, textures, and styles to keep the look fresh and contemporary. Beyonce wore a short, fitted white dress while another ‘maid rocked a crop top and pants. 6. Get personal with the music. Since Solange is a DJ and her sister is, well, Beyonce, you KNOW music was a big part of the day. The bride walked down the aisle to a symphonic instrumental version of Donny Hathaway’s, “I Love the Lord, He Heard My Cry,” which is one of her and Ferguson’s favorite songs. To incorporate this detail into your wedding day, pick a song that is meaningful to you, and search for an instrumental version to make it feel wedding-worthy. Can’t find a good version? Have a string quartet create an arrangement to play during your ceremony! Score Solange’s wedding day look on Lover.ly!